WASHINGTON — I’d like to wel­come guest blog­ger Navy Lt. Tiffani Walk­er. In this blog, Walk­er writes about the “Mom shift” she works after a full day on active day, and express­es her grat­i­tude for the ser­vice mem­bers who put their lives on the line to keep fam­i­lies like hers safe. 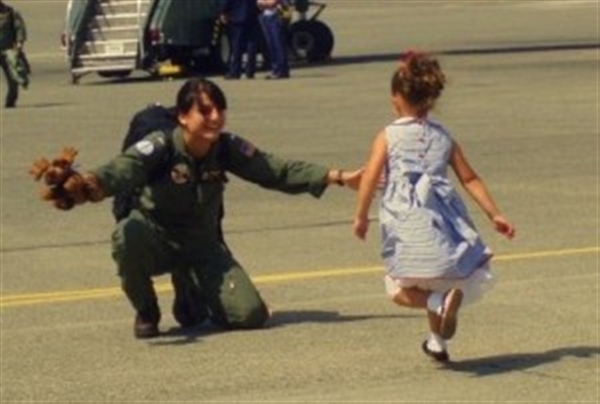 Navy Lt. Tiffani Walk­er and her daugh­ter rush to embrace. I work the “Mom shift” after I fin­ish my day job as a Navy lieu­tenant on active duty. It is that time of night when I have heard that oth­er peo­ple watch their favorite show and catch up with their spouse. Some peo­ple may even read or even get to bed ear­ly. But I pull anoth­er shift at the fac­to­ry where I make school lunch­es, wash bot­tles, sign home­work and ensure the house is picked up enough to not cause injury or infec­tion to my beau­ti­ful kids. The Mom shift is that time of night when sin­gle and some­times-sin­gle-due-to-orders moms like me take care of all of the things that need to be done just to make it to the next day. I find that this time of night is the most reflec­tive for me. I put the kids to bed and do menial tasks that don’t take much brain­pow­er to do. It opens up my mind for a mil­lion oth­er things that I don’t have time for through­out the day. And to be com­plete­ly hon­est, I also inter­nal­ly whine about a num­ber of things, such as why, when I am here alone with two kids, the sewage pipe had to back up in the base­ment and I had clean it up. And about why I have to go it alone as the plumber, mover, finan­cial advi­sor, house­keep­er and pedi­a­tri­cian … Why? Why? Why? And then I remem­ber. My kids are safe in their beds, warm and hap­py and it wasn’t entire­ly my doing. I didn’t go it alone tonight or any oth­er night. I had help from strangers — peo­ple who don’t know those two sleep­ing kids or me. There are men and women around the world from our coun­try and so many oth­ers who are fly­ing, fight­ing, patrolling, div­ing, stand­ing a watch, man­ning a rail and hold­ing the line. It’s a line in the sand drawn in dirt, the air and the ocean that keeps chil­dren like mine safe in their beds. I am grate­ful for the sol­diers, sailors, air­men and Marines that stand afar while I tuck my sweet chil­dren in at night. Thank you all from one grate­ful mom. For more on Fam­i­ly Mat­ters Blog, vis­it the site or check out Fam­i­ly Mat­ters on Face­book and Twit­ter.